We're finally experiencing some relief after several weeks of record temps. After being in lovely Canada, I was not prepared for 100+ back home in Kansas. A little rain and 75-80 degree highs this week is just what I need. 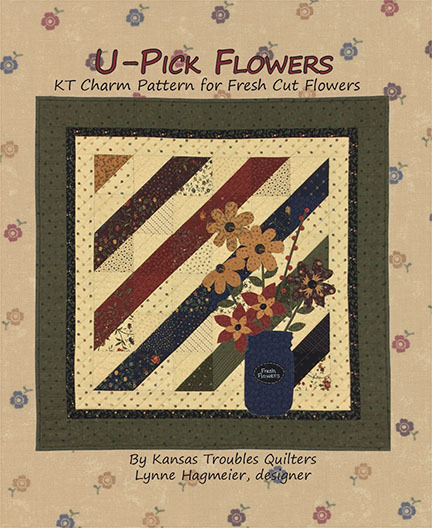 Our August Special is just what you need - hot, hot, hot deals on your favorite KT fabric! 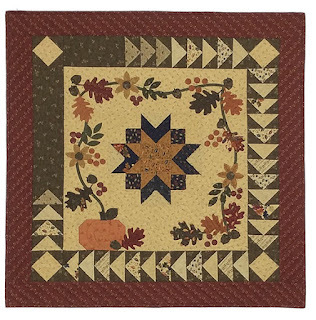 We've bundled 8 assorted prints in every KT colorway - tans, reds, greens, golds, navys, pumpkins, browns, blacks & purples. Can you say stash builder? 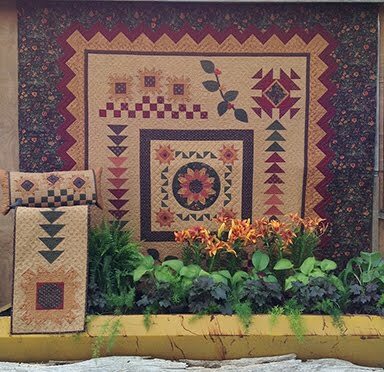 Regular retail price is $22.00/bundle. 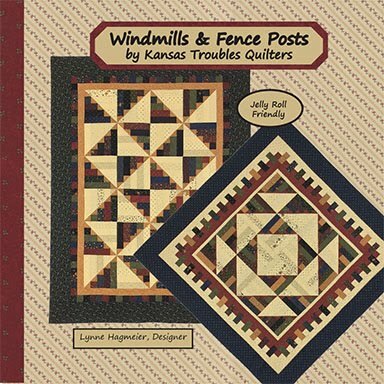 Our August Special is only $17.95 for 8 FAT QUARTERS. 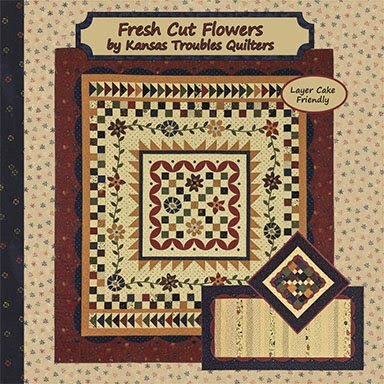 That's only $2.25 per fat quarter (22" x 18"). A rainbow of KT fat quarter 8-packs! 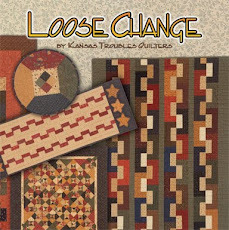 Stock up now for all your fall and winter projects. 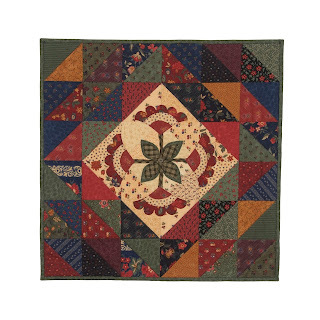 If you're like me, you reach for the same colors over and over again when pulling fabrics for a new quilt. 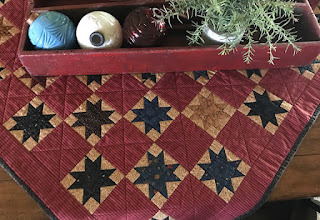 Around here, red is a neutral. I always need more red. Comment here to win your choice of one fat quarter 8-pack bundle. What's your go-to color? I've been traveling alot this summer, from the Quilter's Plus Guild in Glenwood, IL, to two shops in Canada - Chicken Feed Quilts in Coaldale AB & Beaver Creek Mercantile in Caroline AB - to most recently, the East Iowa Heritage Quilt Guild in Cedar Rapids, Iowa. 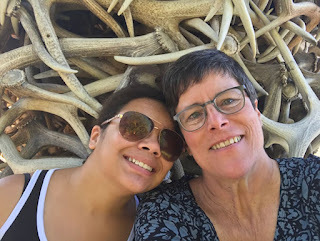 My grandaughter, Aleece, has been my travel buddy/navigator/baggage handler for these trips, although Robert came along to Iowa after being left at home for 2 weeks on our Canadian adventure. 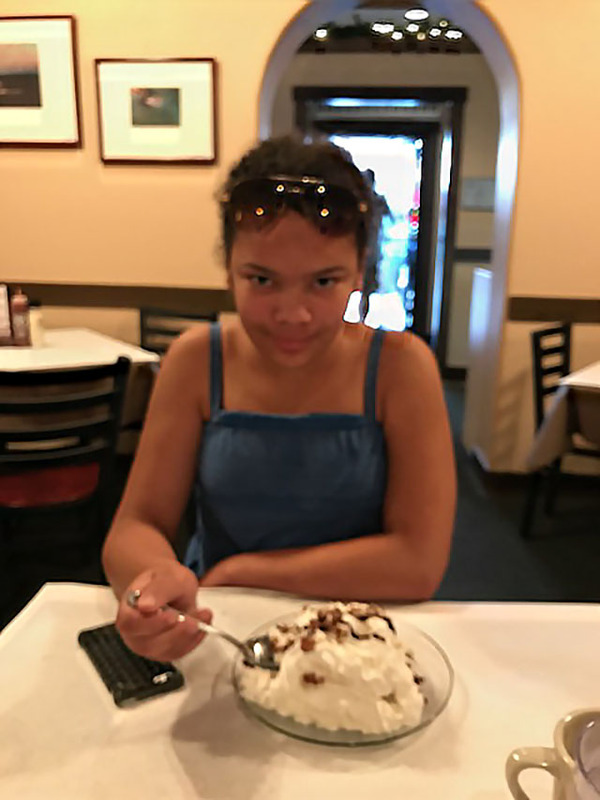 In most of the pictures I have of Aleece, she's eating - waffles, ice cream, cookies, ice cream. You get the idea. She is, after all, a growing teenager. 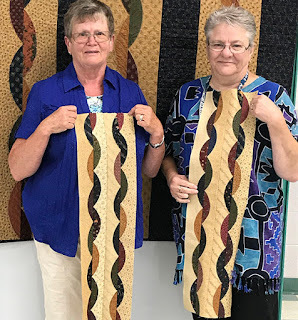 She has been a joy to hang out with and is a great help with the quilters. I only wish one of us would remember to take more pictures at the workshops!! Here are a few of the lovely ladies we met in our travels. Two of my "twisted" ladies. Rustic Stars workshop in Cedar Rapids, IA. Sharing my tips for layered patchwork. 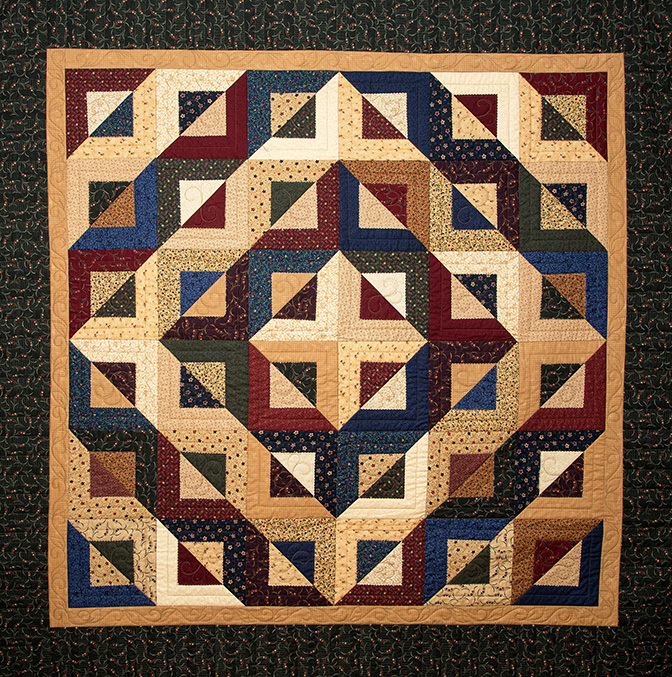 Coming up next, the Saline County Quilt Guild in Benton, AR Aug 21-23. 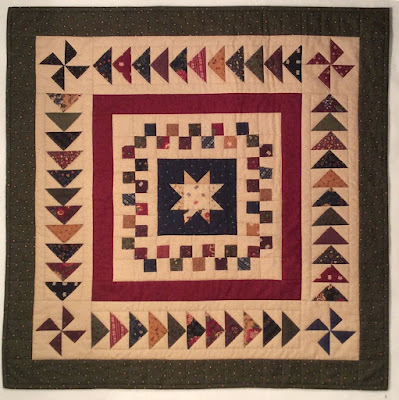 Join us for workshops featuring my Barn Raising quilt and the new Goose Tracks runner. Also on this trip, we'll visit Q.U.I.L.T Guild in Springdale, AR. I'll present a trunk show for their guild meeting August 24, then we'll head to their guild retreat for Clara's Garden & Mini Table Treats workshops on August 24-25. If you're in the area, I hope you'll join us! 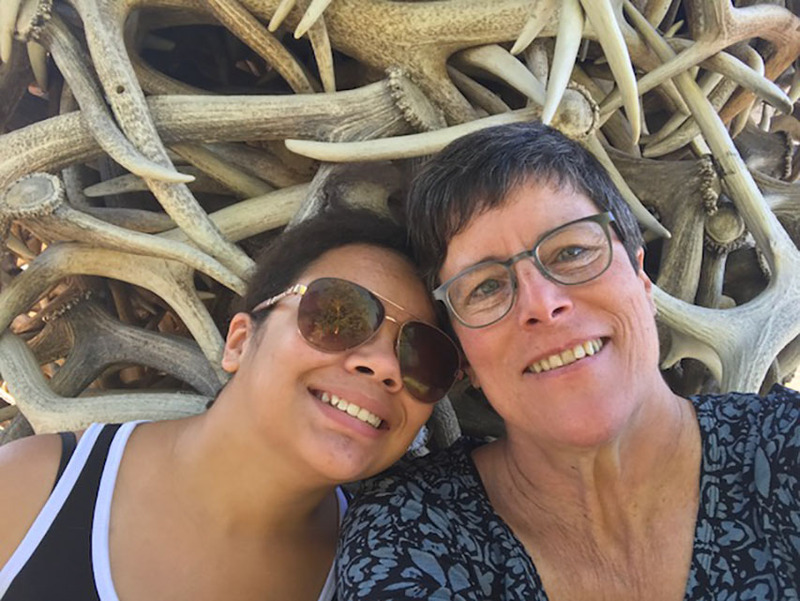 I'll be home just long enough to do laundry and catch up on emails, then off again for a delayed trip with my daughter, Nicole, to New York. She graduated with her Master's degree in Social Work and just received her MSW License. She's earned this vacation! In September, I'll be off to Colorado and Utah for more fun workshops and trunk shows. 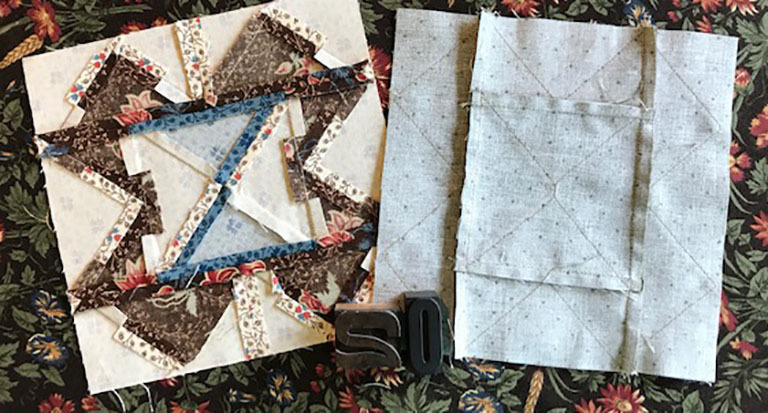 First stop is at the S & B Quilt Guild in Hotchkiss, CO. On Friday, September 8th, I'll be sharing my layered patchwork technique with our Mini Charm Sampler, then a trunk show on Saturday. 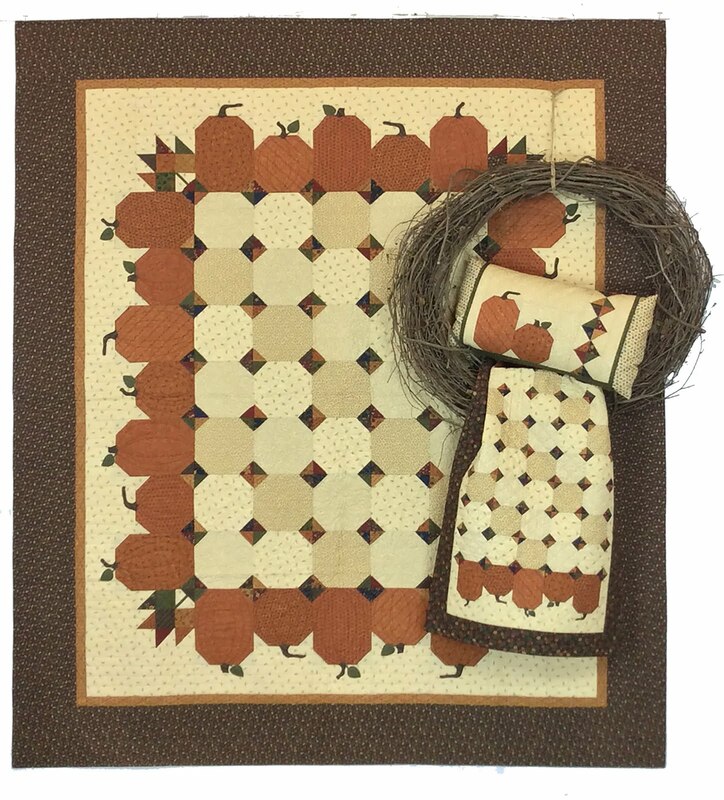 I'll visit Hi Fashion Quilt Shop in Grand Junction, CO next, Sept. 11-12, teaching Rustic Stars and Pumpkin Harvest. Spots are still available for the workshops, so call the store today to sign up! My last stop on this adventure is at the much-acclaimed Quilter's Lodge in Draper, UT. 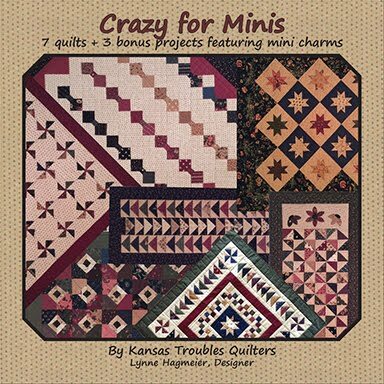 The ladies at Thimbles & Thread Quilt Shop are our hosts for the weekend retreat where I'll be teaching my Cruisin' Sampler and a selection of Mini Table Treats.For more information, CLICK HERE. 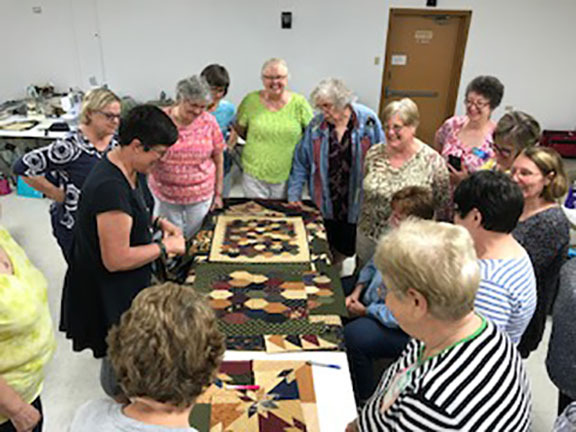 I love meeting quilters from all over the country and hearing their quilting stories. 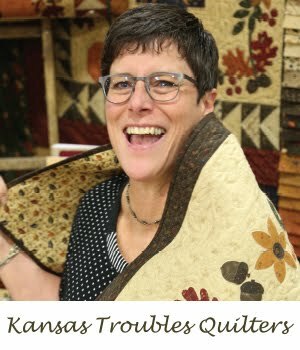 If you've ever wanted to see dozens of KT quilts, hear my quilting story and simply hang out, these trunk shows and workshops are your best opportunities. Hope to see over the next couple months at one of these KT events near you. 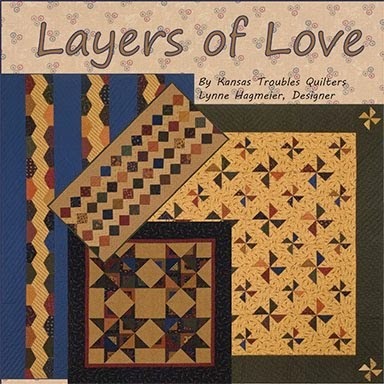 Cruisin' Sampler - Learn tips & tricks about my Layered Patchwork technique all in one quilt! 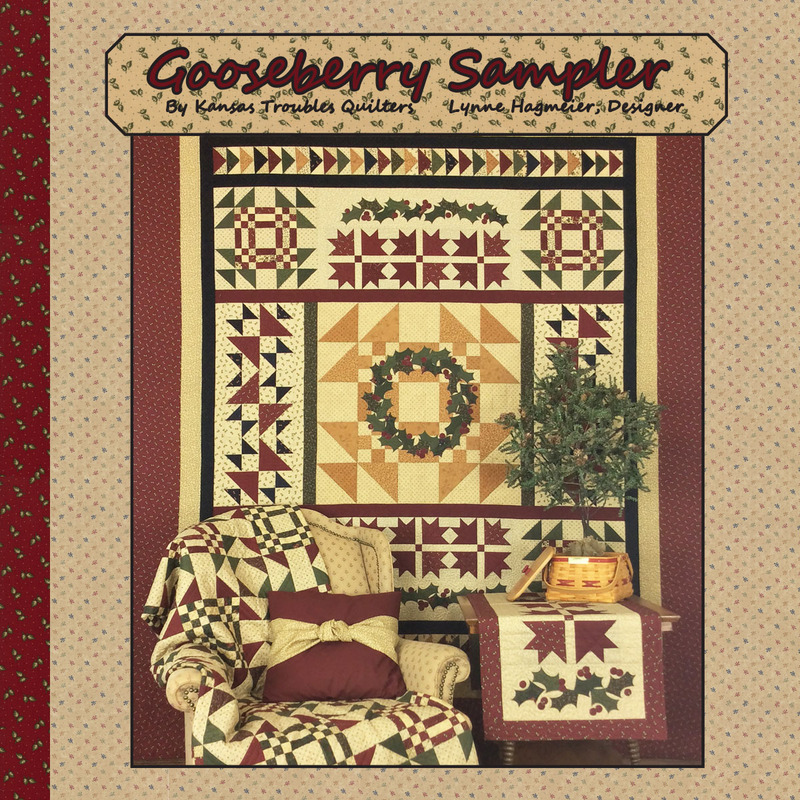 Comment to win a scrap bag of Gooseberry Lane fabrics. So much Christmas stuffed in a bag! 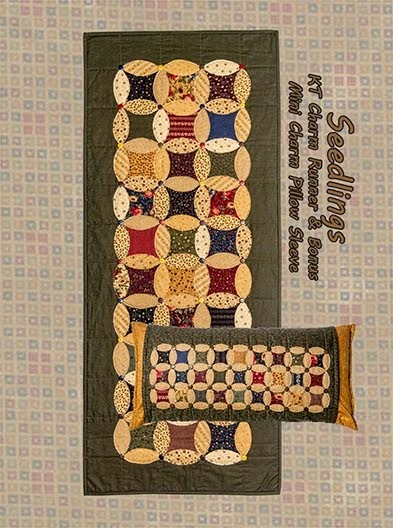 Do you put labels on your quilts? 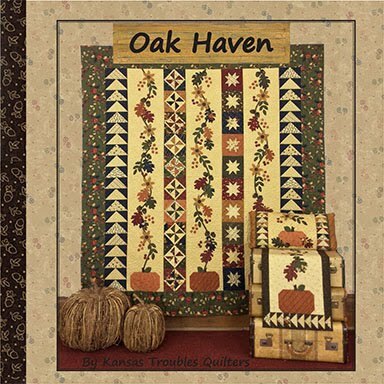 The correct answer is YES, of course, I'm very organized and every quilt is labeled. However, I fall down here pretty regularly. My piecers are trying to come up with a better plan for making sure the quilts we're rushing to complete before market have labels ready to go for the quilters. We'll see if it works. 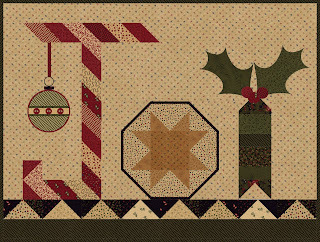 I love the new panel of labels by Moda with 51 different options by all the designers due in quilt shops next month. So fun! If that doesn't move me to act, nothing will! 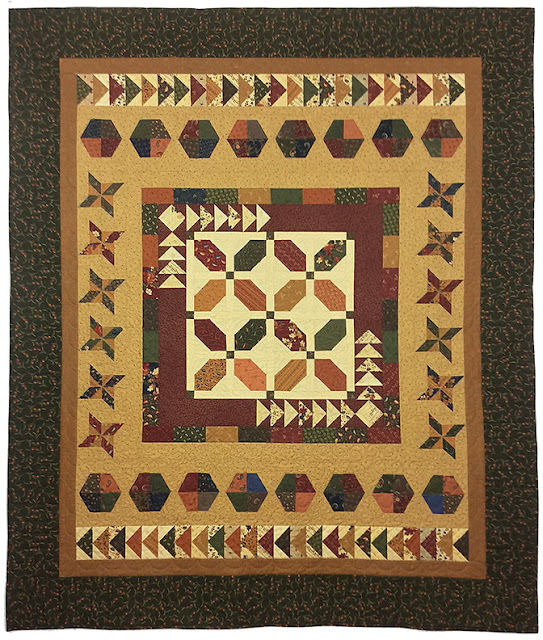 Jo's flying geese block offers more practice making these "fun"-ctional units that are so versatile. 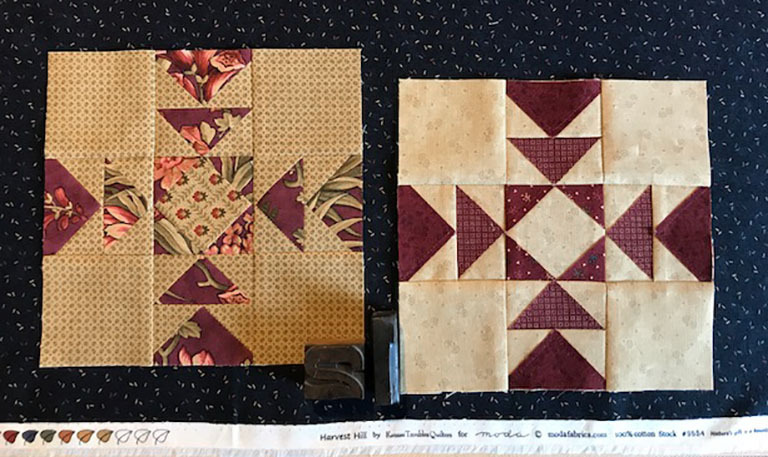 Kathy's traditionally pieced block is made with deep plums and tans for a dressed up block ready for afternoon tea. 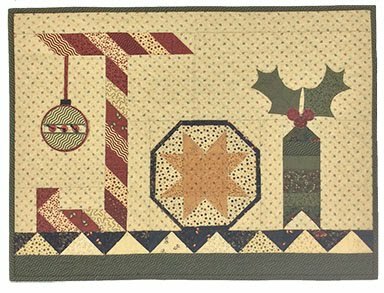 Click on the link above to find Jo's instructions on her blog. 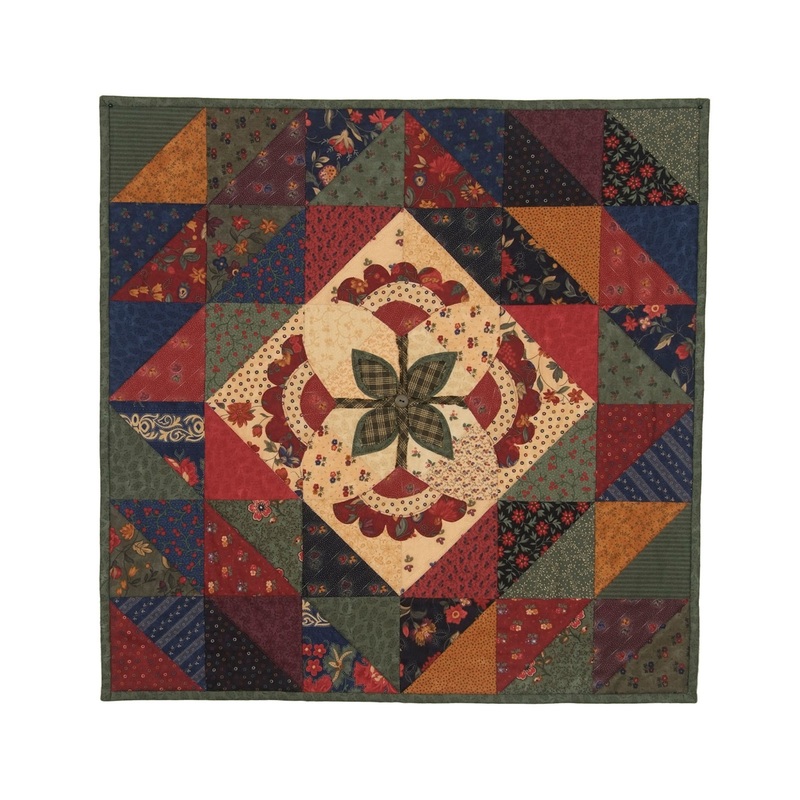 My layered patchwork version is all red scrappy with a neutral tan background. More of a blue jeans version of the block. 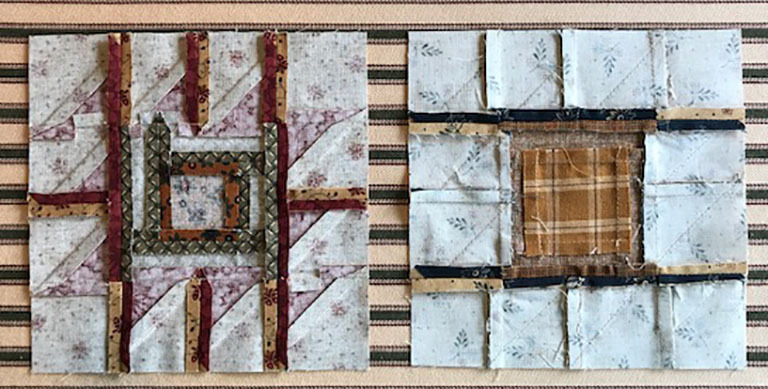 Kathy's traditional block on the left; layered patchwork on the right. 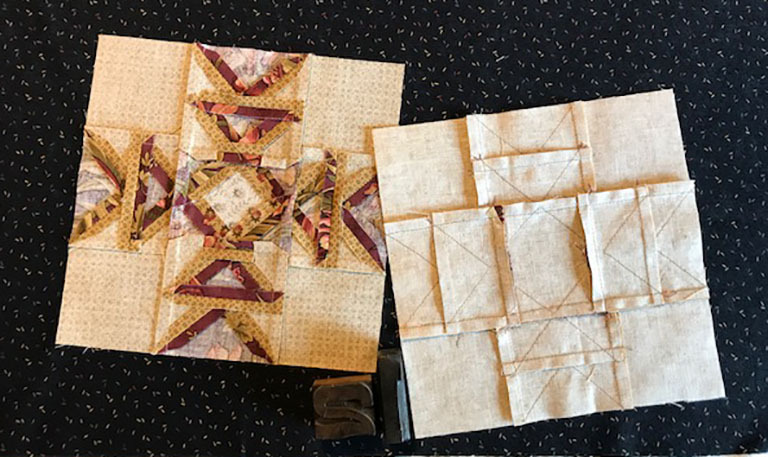 We eliminated a multitude of seams using the layered patchwork technique. 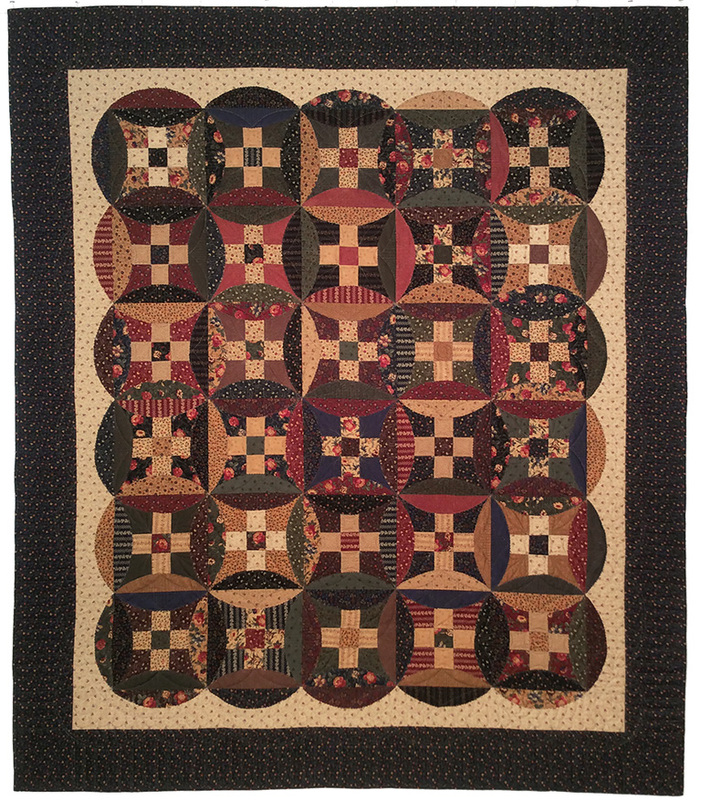 Do you wash/clean your quilts? If so, any special tips to share? As usual, I can't give a straight "Yes" or "No" answer (drives my hubby crazy!). 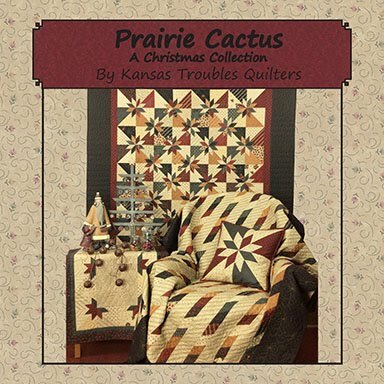 If it's a quilt to display in the store, no. I like the crispness of the sizing so it hangs well. A wallhanging for home or a gift, no. 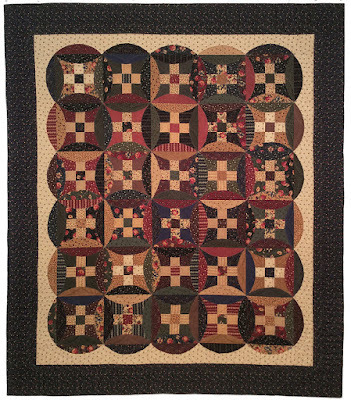 A quilt with layered patchwork that I want to emphasize the dimension, yes - maybe even a couple times. 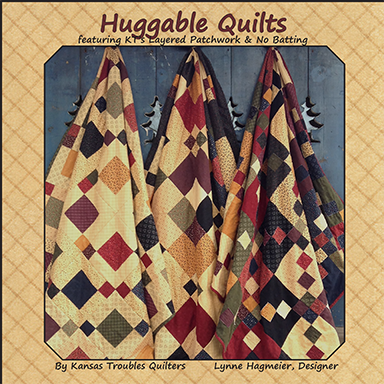 A lap quilt to cuddle up with, absolutely. 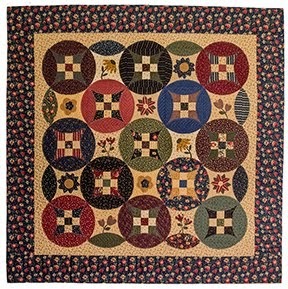 I wash my quilts with a mild detergent made for quilts in a front load washer. 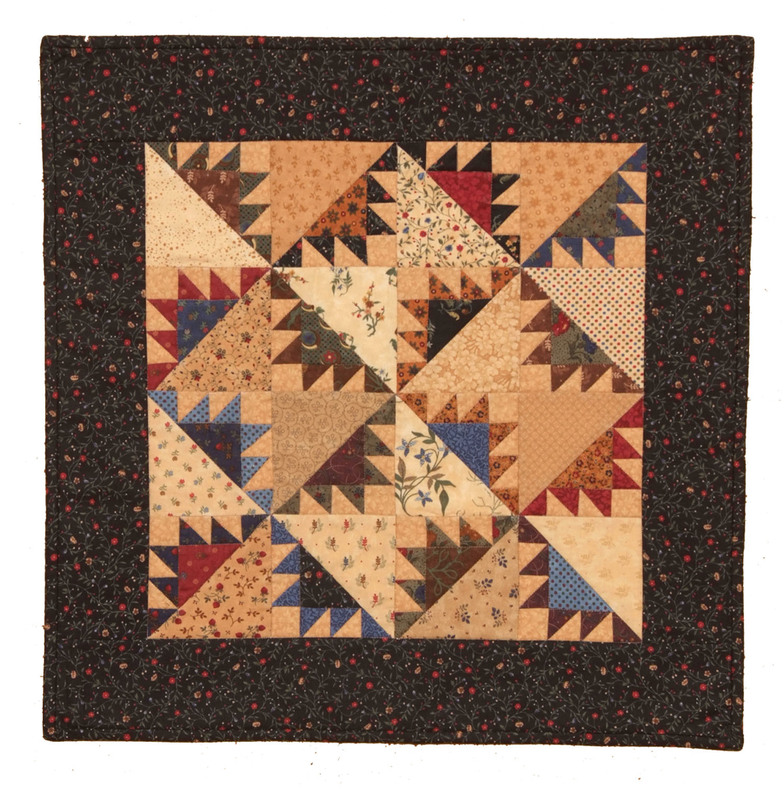 There's much less stress on the stitching when a quilt is tumbled versus agitated (who wants to agitate their quilts?). 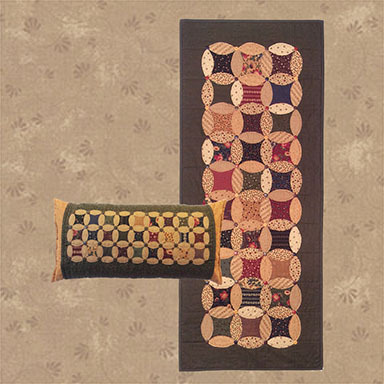 If it's a cuddle up quilt, I'll throw it in the dryer on damp dry for a bit, then lay it out flat to dry. 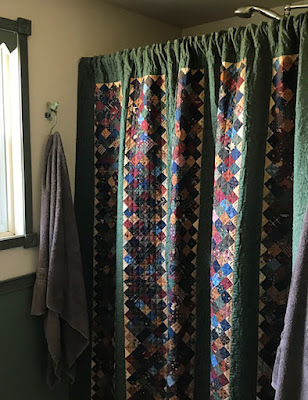 I guess the simplest answer is, I wash my quilts when they need it. 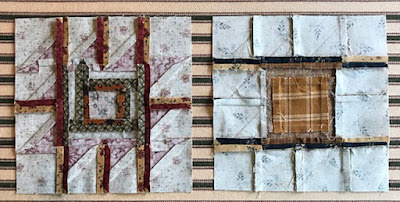 Kathy's traditionally pieced block on the left; layered patchwork on the right. 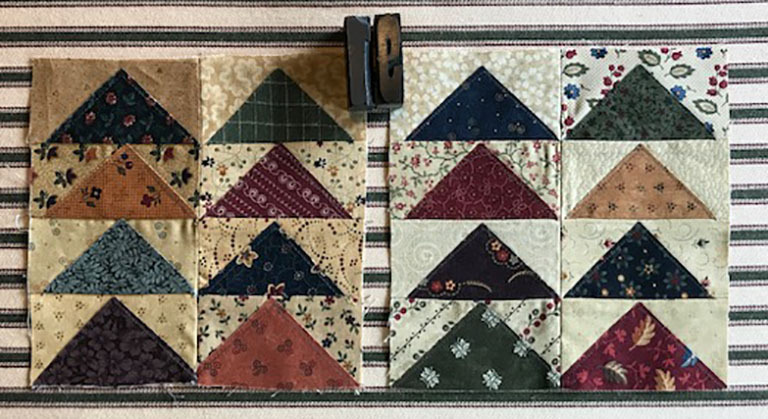 Click here for my layered patchwork instructions for Block #20. See what all the designers are up to this week. 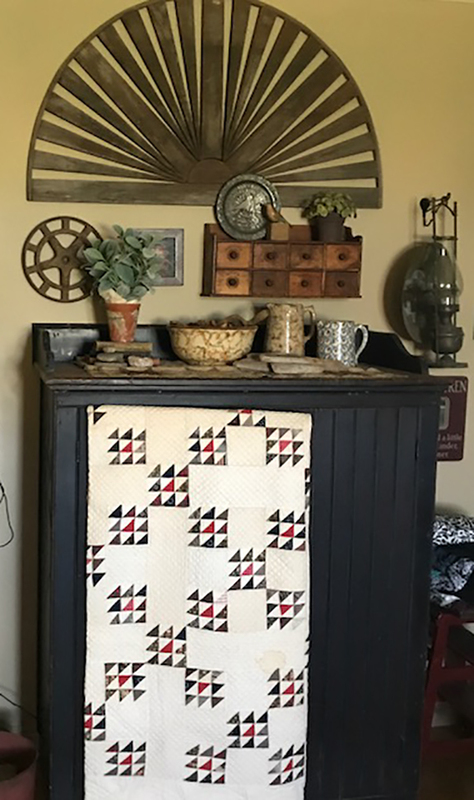 Do you display your quilts in your home? If so, how? 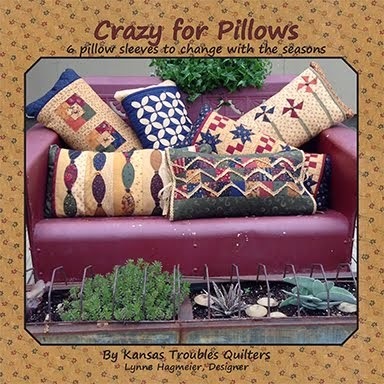 They're everywhere - on the bed, over the headboard, on sofas & chairs, table tops, in baskets, as a shower curtain. 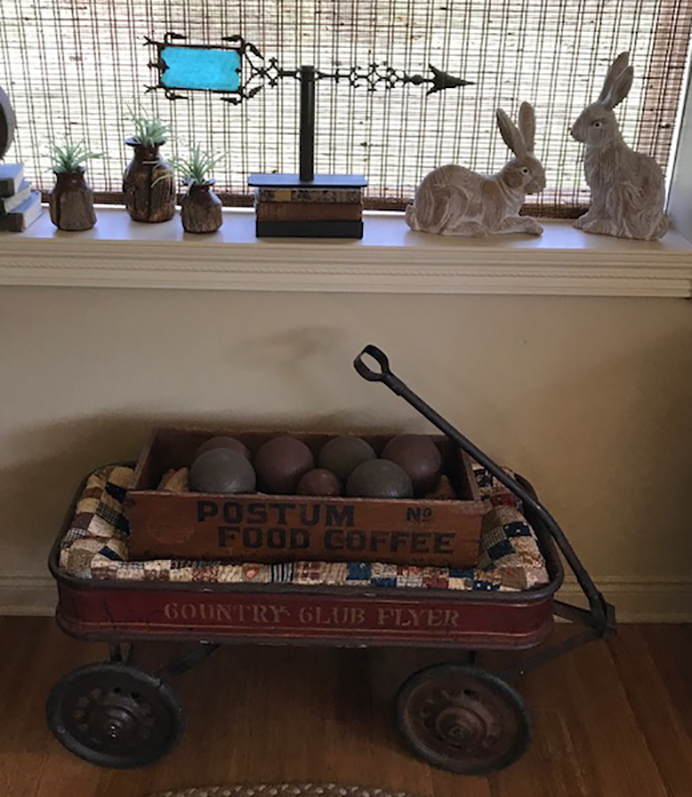 Some are ones I made, some are antiques. 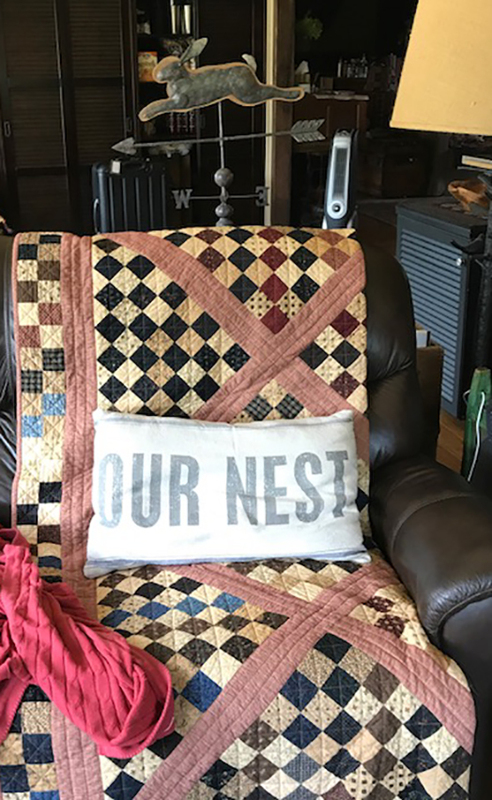 I change them out for the season, but Robert and I have our favorites on our recliners. (I literally just walked around the cabin and took a few shots, so please excuse the dust bunnies, crooked lamp shades and miscellaneous background "stuff" in the pictures. 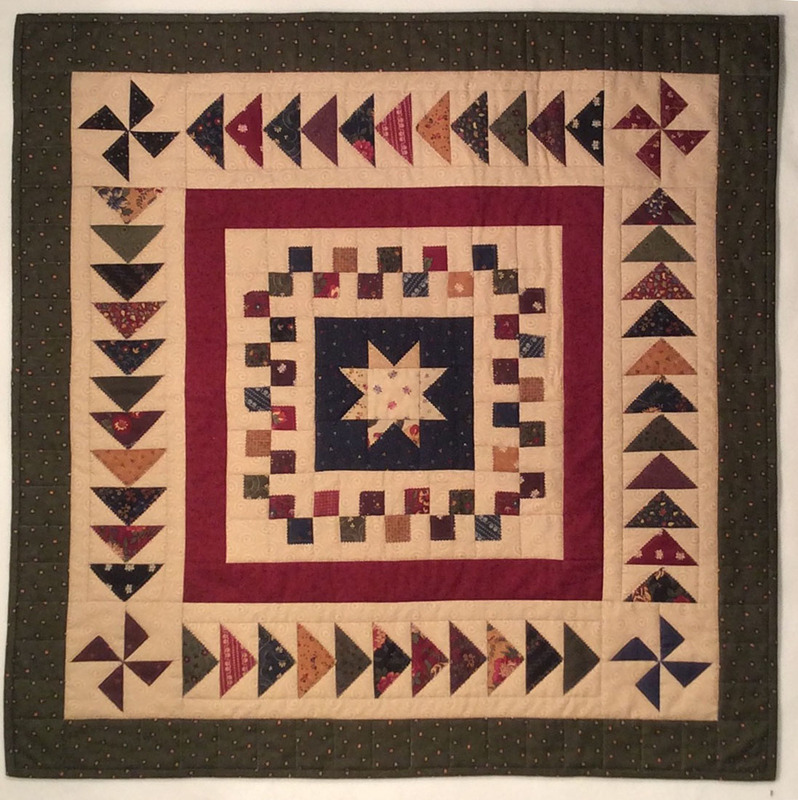 Flag quilt made by Lois Sprecker - LOVE IT! 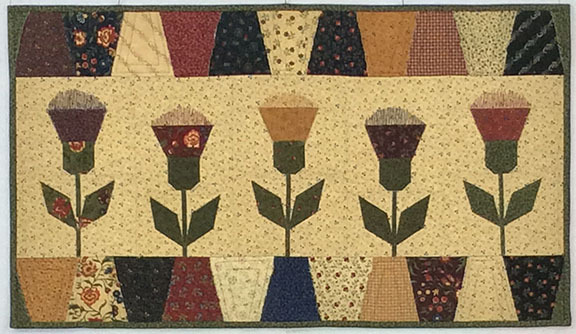 Quilt top -not in great shape but great color folded just right. One of my fav flannels. Kitchen table. 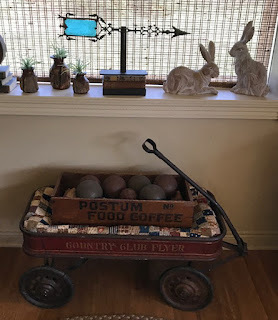 Lightning rod balls in red/white/blue. I like the movement in flying geese blocks. 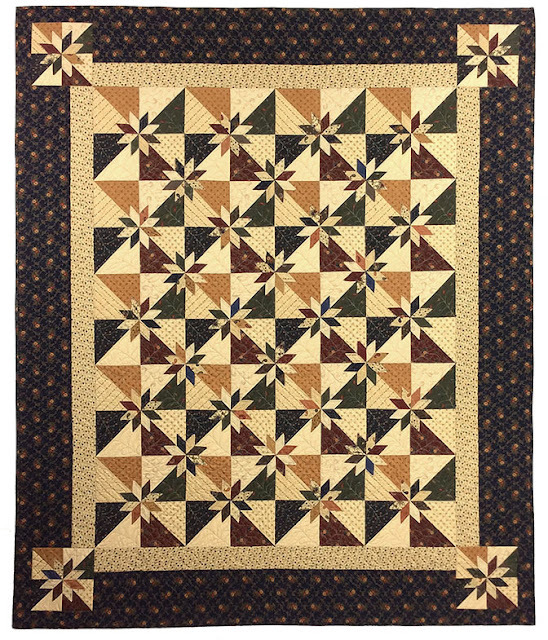 You can entice the viewer's eye to travel across your quilt to focus on the best parts. 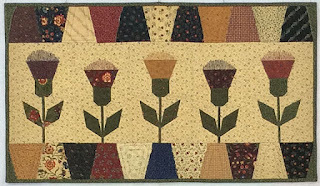 Or a row of them make a great filler/border. 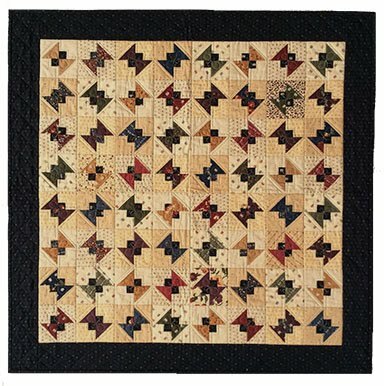 However, I hear from alot of quilters that they avoid flying geese - "I lose my points", "They don't come out square", "The geese are lumpy", etc. My layered patchwork technique makes flying geese sooooo easy. 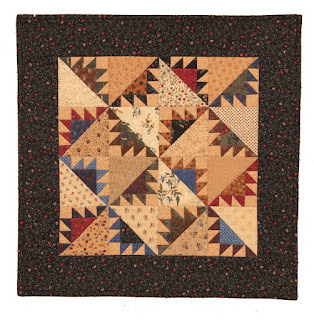 If you haven't tried LP with any other block, this is the one to try. 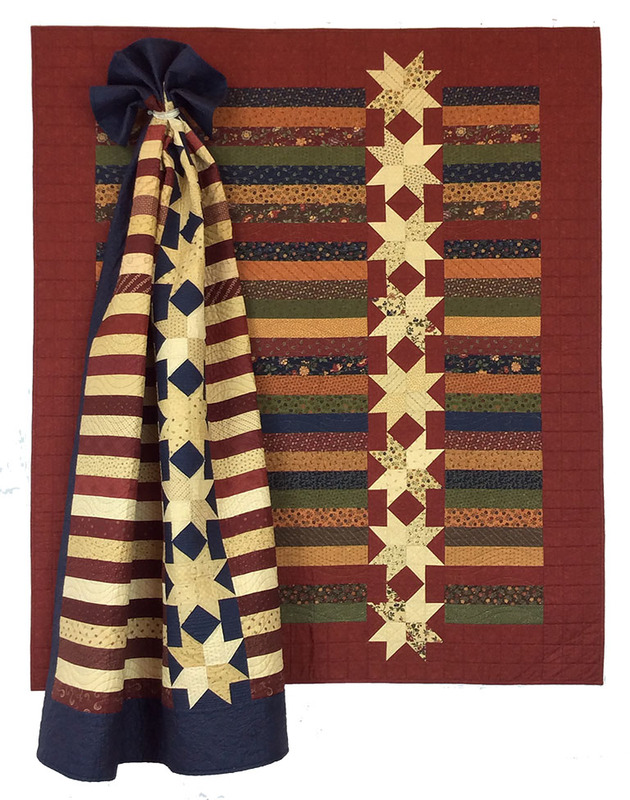 Click on the link above for my Layered Patchwork option. The instructions are for only (4) flying geese. I'm planning to use strips of geese for sashing in my quilt. 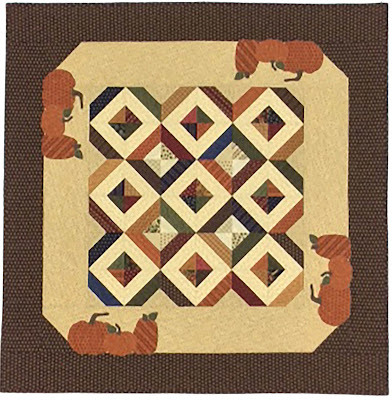 Cut (8) of the B-tan background to make two rows of (4) geese each for a 6 1/2" block. 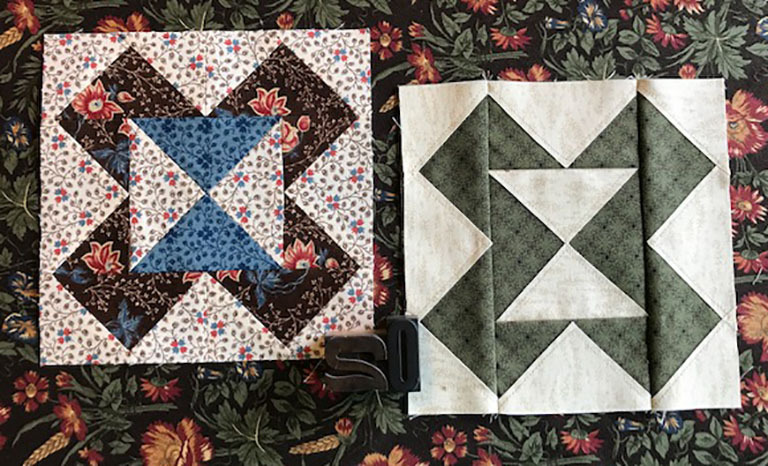 Kathy & Joy both chose to go scrappy with their geese and backgrounds. If you prefer traditional flying geese, see the link below. Kathy's LP on the left; Joy's LP on the right. KT Flying Geese LP Conversion Chart. FYI: I'm making extra flying geese to use as sashing in the setting for my Blockheads quilt, along with other 3"x 6" elements from blocks. 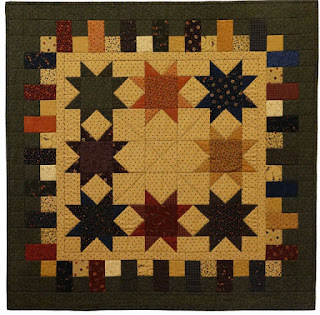 Pairs of some of Betsy's little blocks would be great! 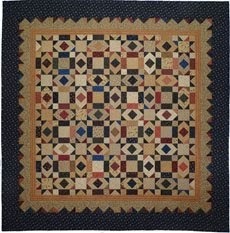 Watch for a preview of the block setting for my quilt later this summer. 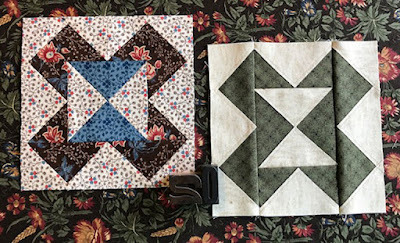 I'd forgotten some of the tricks I used in the past for flying geese using the connecting corner method. 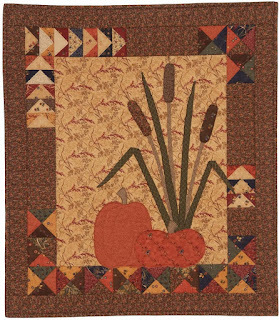 Try stitching just to the inside (toward the corner) of your diagonally drawn line. 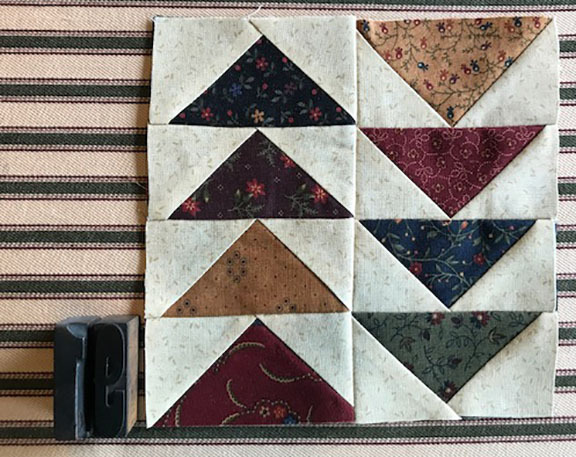 Your square will press toward the corner more accurately. Trim the inner tan triangle for less bulk. I chose to make my tan background all the same, but flipped the rows of geese for fun. 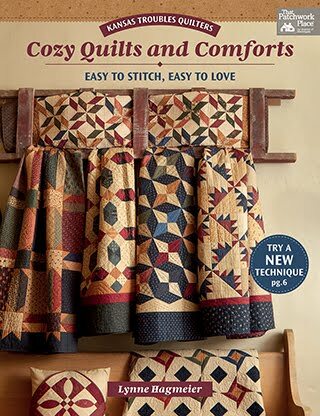 Do you sew or stitch every single day? Do you plan it? Or is it a habit? How much time do you spend each day stitching? 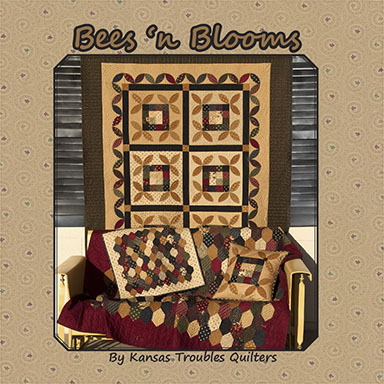 I have good intentions to sew every day, but something always seems to get in the way. I spend more time on the computer designing and writing patterns. 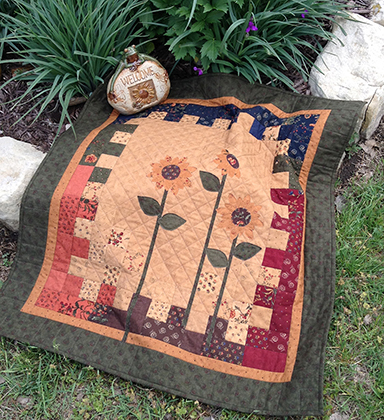 When I receive new fabric, I sew like crazy for days and nights, then it's market, and I'm done. Kinda feast or famine around here, I guess. 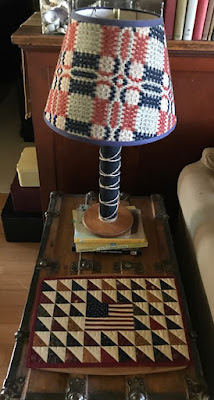 I plan to make a small red/tan/blue project over the July 4th weekend as a birthday present to myself, and usually do the same New Year's Day. Not my fabric, not my pattern, something totally for fun. I look forward to it all year. 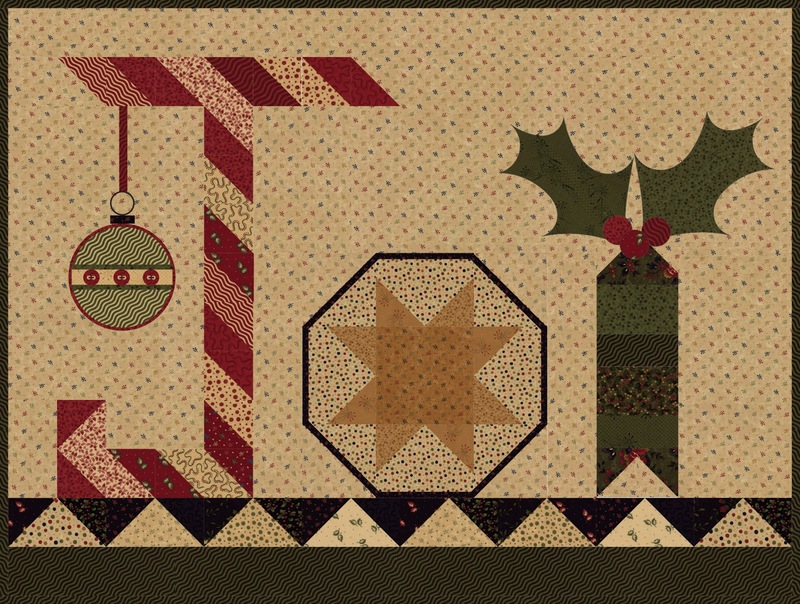 I think I need to add a few more fun sewing days to my calendar. 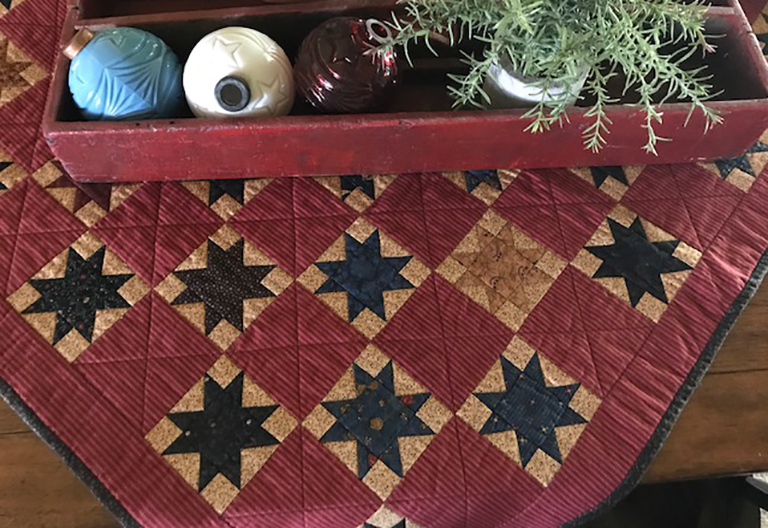 I'm on my way to Canada to teach/play at two quilt shops next week - Chicken Feed Quilts in Coaldale, Alberta (July 10-11) and Beaver Creek Mercantile in Caroline (July 13-14) just a few hours away. If you're in the area, I'd love to meet you! 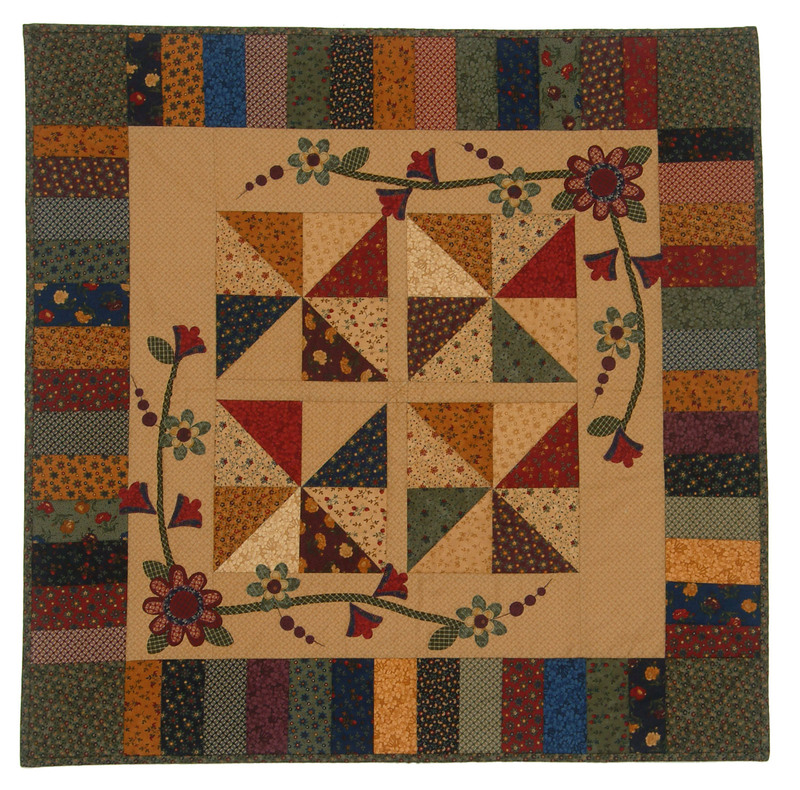 Call the quilt shops above for more information on program/workshops. 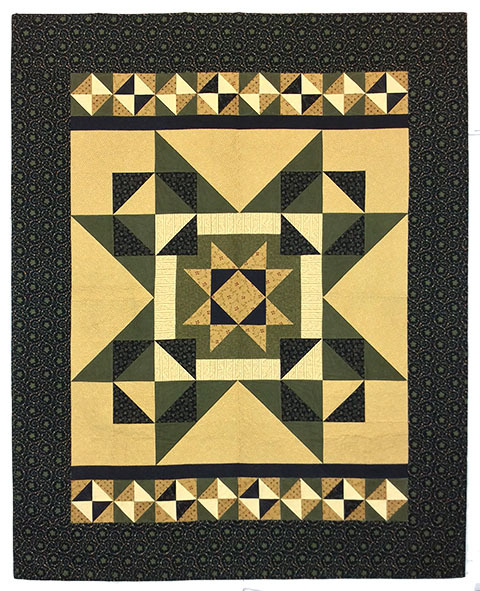 Simple block, good bones, looks great in multiples creating a secondary pattern. What more could you ask for? 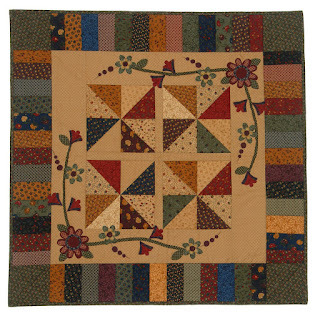 Click on the block name above to go to Carrie's blog for instructions. My piecers did their thing - Kathy's traditionally pieced block is on the left, Joy's layered patchwork block is on the right. It's really hard to tell the difference from the front, but there's a major difference in the number of seams on the back. By layering a triangle over a square & topstitching, your background doesn't change so your block is easier to piece and is true to size with very little chance of losing points. 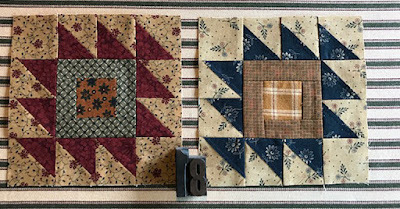 Click here for my Layered Patchwork optional instructions for Block #18.